A regular breeding resident and migrant; late-fall migrants frequently linger into the winter months and occasionally overwinter in open-water areas, especially in southeastern Minnesota along the Mississippi River. The Redhead was an uncommon species during the Minnesota Breeding Bird Atlas (MNBBA). Relative to many waterfowl, the Redhead has a fairly limited distribution, restricted primarily to south-central Canada and the northern Great Plains and northern Rockies. Scattered, small populations also occur west and south of its primary breeding range and farther north in Alaska. Although western Minnesota forms the periphery of the core of the species’ breeding range, smaller numbers occur east through the Great Lakes and along the St. Lawrence River. Highest breeding densities are found in the prairie potholes, especially in central North Dakota (Figure 1). A game species, the Redhead has been assigned a Moderately High Continental Priority by the North American Waterfowl Management Plan. It has been assigned a Continental Concern Score of 8/20 by Partners in Flight. A short- to medium-distance migrant that winters in the central and southern United States and Mexico. A diving duck that feeds primarily on aquatic plants and aquatic invertebrates. A platform constructed in emergent vegetation in semipermanent or permanent wetlands; occasionally nests on muskrat houses. Redheads are often nest parasites and lay eggs in other redheads’ or other species’ nests. Breeding distribution and relative abundance of the Redhead in North America based on the federal Breeding Bird Survey from 2011 to 2015 (Sauer et al. 2017). When Roberts (1932) wrote his account of the Redhead’s status in Minnesota in the early 1900s, he had already witnessed its near demise, as had been the case for so many other waterfowl species. Once an abundant breeding resident throughout the state’s western prairie region, by the 1920s the Redhead was largely known only as a spring and fall migrant. A few scattered reports of nesting pairs were still reported but they represented mere fragments of a once abundant population. Roberts wrote that in its heyday Heron Lake was the center of abundance of both Redheads and Canvasbacks in the mid-1800s. Thomas Miller, a long-time hunting guide on Heron Lake, wrote to Roberts remarking, “This fine bird at one time was the most plentiful Duck on Heron Lake. From 1883 to 1893 several thousand were killed every year.” As for the Canvasback, large numbers also were reported nesting near Thief and Mud Lakes in eastern Marshall County until the area was drained. Although there were occasional reports farther to the east, “in the heavy timber of the northeastern part of Minnesota,” the Redhead was most abundant in the western grasslands. Despite the decimation witnessed in the late 1800s, by the late 1920s there were hopeful signs that numbers were beginning to rebound with the recent passage of the Migratory Bird Treaty Act. When Breckenridge undertook a field survey of western counties in May and June 1929, he observed an “unexpectedly large” number of Redheads from Lincoln County in the southwest, north to Kittson County on the Canadian border (Roberts 1932). 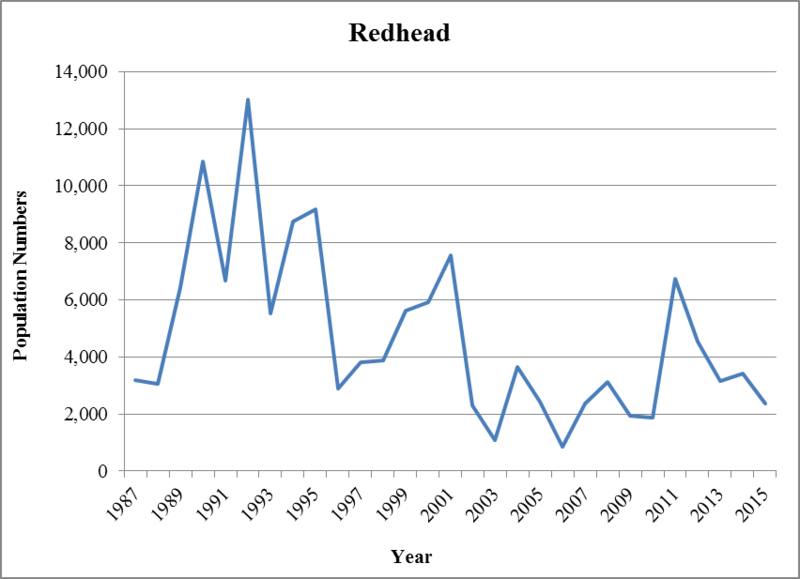 Thirty years later, in 1964, Lee and his colleagues (1964) noted that Redheads had rebounded to the point that they comprised 6% of the breeding ducks surveyed by the Minnesota Department of Natural Resources each spring. A decade later, Green and Janssen (1975) reported the species was well established as a summer resident throughout western and central Minnesota, with records extending as far east as the Twin Cities metropolitan region. They delineated the species’ primary breeding range as occurring throughout northwestern and southern Minnesota, east as far as Hennepin County in the north, and Freeborn County in the south. Janssen’s updated account in 1987 expanded the species’ primary breeding range to the east so that it encompassed the western two-thirds of the state. He identified 20 counties where nesting had been confirmed since 1970. The records were widely distributed across the state with the exception of the north-central, northeastern, and southeastern regions. Hertzel and Janssen (1998) later added 6 counties to the number where nesting had been confirmed, all within the species’ primary breeding range. Field work conducted by the Minnesota Biological Survey has documented 112 breeding season locations. The records are largely restricted to the species’ known range in the Prairie Parkland and Tallgrass Aspen Parklands Provinces of western Minnesota. There also were scattered reports from more eastern localities, including the Twin Cities and the Mississippi River floodplain in Goodhue County, and 1 record in eastern Lake County (Minnesota Department of Natural Resources 2016). MNBBA participants reported 274 Redhead records from 4.3% (206/4,740) of the surveyed atlas blocks and from 4.3% (100/2,337) of the priority blocks. Breeding was confirmed in 26 of the surveyed blocks (Figures 2 and 3; Table 1). The birds were observed in 45 of Minnesota’s 87 counties, and breeding evidence was confirmed in 14 counties. Clearly the west-central region of the state is a strong center of distribution. Important breeding habitat is also provided by the Agassiz National Wildlife Refuge and the Thief Lake Wildlife Management Area in Marshall County in northwestern Minnesota. Although it has never regained its former level of abundance observed in the mid-1800s, the Redhead is well established as a breeding resident in the state. Elsewhere within its breeding range, the Redhead extended its range into Alaska in the mid-1900s and established small, localized populations farther east along the Great Lakes and in the northeastern United States and southeastern Canada. Some of these far eastern populations may have resulted from the release of captive-reared birds, although some natural pioneering eastward also occurred (Woodin and Michot 2002). The species is an uncommon and sparsely distributed species in Wisconsin (Cutright et al. 2006), Michigan (Chartier et al. 2013), and Iowa (Iowa Ornithologists’ Union 2017). It is common east of the Missouri River in South Dakota (Drilling et al. 2016) and in eastern and northern North Dakota (Woodin and Michot 2002). Breeding distribution of the Redhead in Minnesota based on the Breeding Bird Atlas (2009 – 2013). Summary statistics of observations by breeding status category for the Redhead in Minnesota based on all blocks (each 5 km x 5 km) surveyed during the Breeding Bird Atlas (2009-2013). Summary statistics for the Redhead observations by breeding status category for all blocks and priority blocks (each 5 km x 5 km) surveyed during the Minnesota Breeding Bird Atlas (2009-2013). Considered a habitat generalist, the Redhead uses a variety of seasonal and semipermanent wetlands with dense stands of emergent vegetation (Figure 4). The most suitable wetlands in the Prairie Pothole Region have either a mix of open water and vegetation or are completely covered with emergents. Basins are generally small, averaging 0.5 to 0.8 ha. Water depths vary widely but most commonly range from 20 to 50 cm (Woodin and Michot 2012). Typical Redhead breeding habitat in Minnesota (© Lee A. Pfannmuller). Population numbers for the Redhead are estimated by the Waterfowl Breeding and Habitat Survey, a coordinated effort conducted by the U.S. Fish and Wildlife Service and the Canadian Wildlife Service. The survey is conducted in two very large areas: the Prairie Pothole Region of the United States and Canada (known as the Traditional Survey Area), and the eastern Canadian provinces and the state of Maine (known as the Eastern Survey Area). Minnesota is not included in either area. Because Redheads reach their highest breeding densities in the Prairie Pothole Region, the survey results from the Traditional Survey Area are considered the best indicator of Redhead population numbers. Survey work conducted in 2015 in the Traditional Survey Area generated a population estimate of 1.2 million birds (Zimpfer et al. 2015), nearly double the 640,000 population goal established by the North American Waterfowl Management Plan (2004) for the Prairie Pothole Region. Since the survey began, Redhead population numbers have ranged from a low of 323,000 birds in 1961 to a high of 1.4 million birds in 2011. For nearly 30 years, from 1965 to 1995, population numbers remained relatively stable but gradually increased in subsequent years despite a major fluctuation in the early 2000s (Figure 5; Zimpfer et al. 2015). Although Redhead numbers in the Prairie Pothole Region demonstrate an overall population increase, the reverse is true in Minnesota (Figure 6). The long-term average population size between 1987 and 2000 was 6,342 birds; the long-term average between 2001 and 2015 was only 3,156 birds. Although they were the 6th most abundant duck in the 1960s (Lee et al. 1964), in 2015, they ranked 11th of 18 species (Cordts 2015). Although not statistically robust, data collected by the federal Breeding Bird Survey reflect similar trends: stable to recently increasing at the national level, and decreasing in Minnesota (Sauer et al. 2017). The specific factors responsible for changes in Redhead population numbers are somewhat speculative. In Minnesota, their declining population is not unlike that observed for many members of the state’s waterfowl community, which have been impacted largely by a loss of wetland acres and by degradation in wetland quality on those acres that do remain. At the landscape scale, Redheads are benefiting from wetter conditions in recent years and more aggressive conservation efforts that are underway, particularly in the Dakotas. But the birds are also sensitive to wetland conditions and respond by readily changing their reproductive strategy. When habitat conditions are favorable, Redheads maximize reproductive success by parasitizing neighboring nests and raising their own clutch. When conditions are poor, they reduce their energy expenditures by choosing not to nest or to only parasitize other nests. The result can be widely fluctuating numbers from year to year (Baldassarre 2014). Some studies suggest that factors on the wintering grounds may be a more important predictor of population size. The Redhead’s significant reliance on one food item during the winter months, shoalgrass rhizomes, increases their vulnerability. Indeed, in the Texas portion of the Laguna Madre, there is evidence that heavy grazing of these beds reduces the biomass available the following winter (Mitchell et al. 1994). This is further complicated by a long-term decline in the size of the shoalgrass beds throughout the coastal lagoons (Baldassarre 2014). The availability of this food resource may be the most important predictor of Redhead population numbers. Population estimates for the Redhead in the Traditional Survey Area, 1955–2015 (Zimpfer et al. 2015; dashed line is the NAWMP population goal). 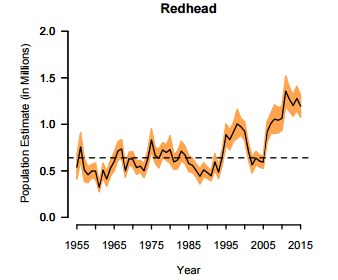 Redhead numbers reported during the Minnesota Waterfowl Survey, 1987–2015 (data not corrected for visibility; taken from data presented in Cordts 2015). The North American Waterfowl Management Plan (2004) has designated the Redhead a Moderately High Continental Priority. Although population numbers have recently surpassed the 2004 objective, considerable challenges remain, particularly on the wintering grounds. Partners in Flight (2017) assigned the species a moderately low Continental Concern Score of 8/20. Redheads were slow to recover from the slaughter in the late 1800s; thus, regulations that tightly manage hunting have been an important factor in protecting the species. The birds are a favorite among waterfowl hunters because of the ease of bringing birds into decoys. Bag limits have been used to insure that annual hunting mortality is commensurate with overall population goals. During the fall of 2015, Redheads comprised only 2.1% of the total duck harvest in the United States (a total of 234,643 Redheads harvested). Only 16,480 birds were harvested that same year in Minnesota (Raftovich et al. 2016). Approximately 37% of the total Redhead harvest occurred in the Mississippi Flyway. On the breeding grounds, the most important conservation measures are the continued emphasis on habitat protection and restoration. In Minnesota, partnerships at the federal, state, and local levels designed to implement the goals and objectives of the Minnesota Duck Recovery Plan (Minnesota Department of Natural Resources 2006) and the Minnesota Prairie Conservation Plan (Minnesota Prairie Plan Working Group 2011) are critical for the future of all wetland and grassland species. These measures are even more critical given the potential impact of climate change on species dependent on the Prairie Pothole Region. The region supports 50% to 80% of the continent’s duck population but contains only 10% of the continent’s wetlands. The “State of the Birds 2010 Report on Climate Change” noted that climate change models predict the loss of two-thirds of the region’s wetlands (North American Bird Conservation Initiative 2010). A recent analysis of how climate change might affect nearly 600 North American birds gave further credence to this concern. The Redhead was among the species analyzed, and the modeling results predicted a loss of 79% of the species’ current breeding range (Langham et al. 2015; National Audubon Society 2016). A major concern is the fact that a high percentage of the continental population winters along the Gulf coast of southern Texas and northeastern Mexico, where a rise in sea level could severely impact wintering populations. In light of the analysis, National Audubon classified the Redhead as a “climate endangered” species. Mitchell, Christine A., Thomas W. Custer, and Phillip J. Zwank. 1994. “Herbivory on Shoalgrass by Wintering Redheads in Texas.” Journal of Wildlife Management 58: 131–141.